The Hidden Glasgow Forums • View topic - Washington Street School. As per my other thread on Hill Street Anderston , my research into my family tree continues. My mother's side of the family arrived in Glasgow from County Antrim around 1885, they stepped off the boat and settled across the road in McAlpine Street Anderston where they lived until my Great Gran died in 1947. My Gran died in Garscube Road in 1950 . My late mother who was born in 1930 attended Washington Street School so i headed off earlier in the week with my camera and happily snapped my way around Anderston. I was hoping to get a pic of the Girls entrance to Washington Street School but it's completely fenced off and appears now to be a car park which has electronically controlled gates . Does anyone know who actually owns the building and the surrounding area, as a look inside the school would be wonderful. I believe the school and the playgrounds belong to Glasgow City Council. 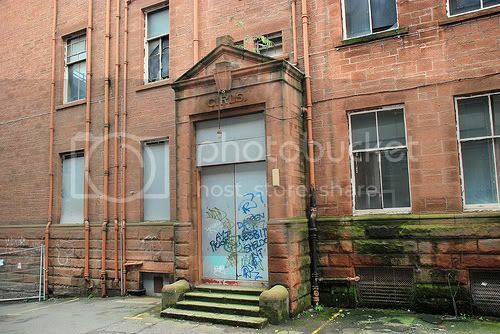 If you Google Washington Street school Glasgow there are a few pictures though no close-ups. It was known as Washington Street Arts centre for a while so searching for that might produce more results and, of course, there's always the Virtual Mitchell site. Last time I was down there the railings surrounding the site didn't really block photo opportunities but it would have been difficult to get close to the building. Maybe if you hang about the site just before 9am you might be able to sneak in with a passing car and out again the same way. what number in McAlpine Street did your Gran live? I was in there several times when it was the Washington Street Arts Centre. Main building, they had temporary seating that they assembled for plays, etc, much like the sort of thing you get in the Assembly Rooms during the Edinburgh Festival. Basement, there were rehearsal rooms used by a variety of (now) better or lesser known bands, including Del Amitri, 30 bob suits and the precursors of Hipsway. I didn't have a camera at the time, so no photos, but I'll see if anyone else has any. The family were at 66 McAlpine Street. I was just hoping for a pic of the entrance to the school, the security took me by surprise. 17 Donald, J. T., & Co., Ltd.
35 Donald, J. T., & Co., Ltd.
49 Duncan, J. 11:1., Ltd.
53 Connal & Co., Ltd.
69 Pooley, Henry, & Son, Ltd.
73, 85 Brown & Co.
Robertson, C. & J., Ltd. Cochran, R. & A. & Co.
Millar, A. Stone, J. Philips, M. Larkin, J. P. Townhind, M.
78 Campbell, A., & Co.
72 JYI:'Harg & Co., Ltd.
48 Alexander, Ferguson, & Co, Ltd.
24 Harvie, Wm. & Co., Ltd.
6 Dunc'1n, A. Kelly, M. O'Hara, M. Hamilton, J. McDonald, J. Good, J. Wasn't there a refrigeration company in Washington St too or was that later? No sign of RM Easdale either in that list? Is it possible to get historical details of residents/companies in any Glasgow streets online? It would have been around the mid 60's when I used to meet my mother at the corner of (I think) Washington St /Argyle St- she worked in Turner's which I thought was a refrigeration company - I might be wrong. The 1911 census has another family member at 39 McAlpine Street. Sorry my mistake it was Brown Street and they weren't a refrigeration company either. Turner & Co - engineering I think but I'll be damned if I can find if it's the same Turner Group now based in Craigton Rd. I remember Turners in Brown Street, were they next door to Pegler & Louden ? I'm sure l remember John Robertson, HG contributor, saying that he had a sister who worked in R.M.Easdale in the 70's. Any relation Bridie or did you know her? No relation.I remember the Easdale family - the old man Easdale who would have been about 60/65 then was a bit of a character and his son called Christian - I think. Mr Stirratt was another boss and I can only recollect the first names of some of the others in the office - Gloria was one and a girl who would have been around my age then 16-18 who's boyfriend sang in a band can't remember the name of the band or hers. The offices were ancient!! Old Mr Easdale would wave down from his office window - top left - to us on a Friday when we finished. I think the family actually came from the island of Easdale.